The beauty of being a fan of music is meeting, speaking and discussing music with other like minded people. People who tune into your tastes and understand your likes, what you enjoy and, more importantly, what’s truly going to get you enthused and all evangelical about. One such person is the manager of North West folk legends Merry Hell, Damian Liptrott, who not only has become a good friend with whom to discuss a shared love of music with, but has also been a great supporter of what I’m trying to achieve with TarkaBlowpigMusic.com. Therefore whenever an envelope drops through my letterbox with a Wigan postmark on it I’m pretty much certain that whatever is included in it will be something that I will enjoy and will be something I’ll feel the need to share, enthuse about and get excited with. 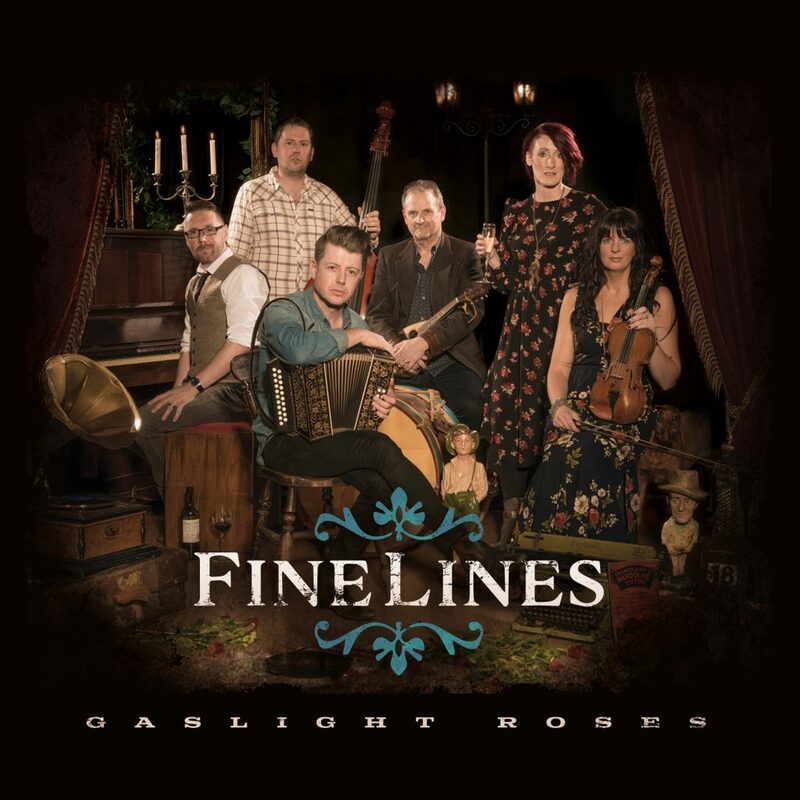 So when I received Gaslight Roses, the second album by Cheshire based six piece Fine Lines, I knew that I was going to be in for one hell of a treat. Now Damian knows, I’m sure, of my love of Americana and modern country music that sits alongside my long standing enjoyment of folk rock music. He’ll know that artistes such as Band era Bob Dylan, Neil Young and Joni Mitchell are go to CD’s from my collection. He’ll also be aware how much I rate much of the Americana that comes out of small town USA, particularly from North Carolina. So he’ll know exactly how well this album fits within those great artists. This is an album chock full of cleverly observed lyrics from drummer Mark Radcliffe that fits wonderfully with the catchy tunes and melodies of vocalist/guitarist David Boardman. These are songs that touch upon the human condition in a simply beautiful way whilst still retaining a joie de vivre that is infectious. Much of which comes from the beautiful playing from the band that includes, along with Boardman and Radcliffe, vocalist Zoe Blythe, fiddles from Emily Doggett, Gary O’Brien’s organ and bassist Alex Berry; musicians who, despite only being together for 3 years, play like they’ve been together for much longer. There is an understanding and trust here that makes this album the complete work it so obviously is. In conclusion if you like a your Americana authentic, genuine, excellently performed, loud and proud don’t limit yourself to America. There’s a band in Knutsford that can take you outside the city limits of country folk rock. A band that plays infectious and glorious music with subtlety and beauty. And that band is Fine Lines.